Day 1 – 26th January 2013 – Monument to Belvedere. Big thank you to Andrew, Yvonne and Sarah for coming and giving moral support and taking pictures – the best of a fabulous set of images is the new site banner. 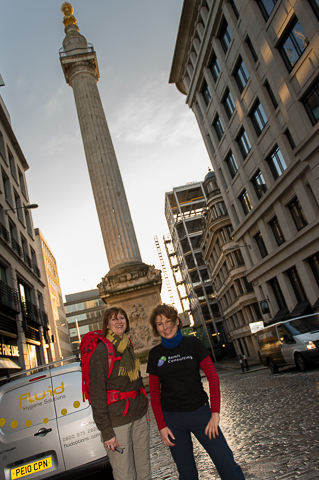 Bridget and I arrived at the Monument just after sun up. It was a beautiful, fresh, blue morning, the sun sparkling on the River Thames and the tower blocks gleaming in the clear air – the Shard looked particularly impress ive and acted as a landmark for most of the day. Owing to the curves of the river, it sometimes seemed to be south as well as west of us, but just as frequently appeared to be to the north – quite disconcerting. After a quick coffee, we started at the Monument, crossed London Bridge and dropped onto the Thames Path. We followed this all morning, past the Tower, through Rotherhithe and Deptford down to Greenwich by lunchtime. As we travelled we continually looked to the North side of the river to admire the skyline but there was plenty of interest on the south side too. We saw the church in Rotherhithe with a memorial to the Mayflower, and a suitably ancient pub opposite of the same name, and then came across the City Farm – it was bizarre seeing sheep, goats and chickens with a backdrop of Canary Wharf. (See Pubs, Cafes and B & B page for more). Deptford still has a traditional parish church, with a mediaeval tower and 17th century main structure. Everywhere along this stretch was full of the history of London and Britain – the great trade route of the Thames, the heart of our economy for two thousand years. The massive wharves, although now converted to other uses still carry a faint scent of spice and chocolate. The great Royal Dockyards and the Royal Naval School and hospital at Greenwich from the heyday of Samuel Pepys and Charles II reminded me of the early development of free trade and the growth of the Royal Navy to protect the trade routes. Once beyond Greenwich, the scenery became much more bleak. The whole stretch out to the 02 was derelict and deserted, apart from the aggregate yards, where diggers were moving heaps of dredged material from the left to the right. The 02 itself still looks wonderful, and we were tempted to join the party climbing over the roof, but decided it looked a bit high! On we went through Woolwich, and past the Royal Arsenal at Woolwich. The sun was still bright, but it was feeling like a winter afternoon as we passed a range of particularly noxious factories and sewage plants. We turned inward to pick up the train at Belvedere and return home to a bottle of well-earned champagne to toast our efforts.